I hope everyone had a great Thanksgiving. 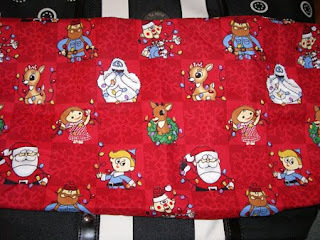 I was able to make a few Christmas themed pillows to take with us to the place we are staying near the hospital. I also made a set of Mistfit Toys pillowcases as a surprise for my husband. We love the misfit toys from the story Ruldolf. I think that will make him smile while we are away for Christmas. Other than that, I've just been packing and weeding things out. It will be a very small hotel/apt room we will be staying at for about 8 weeks near the Johns Hopkins hospital in Baltimore Maryland. Right now with only a few days before my husband's treatments start, we are on the waiting list for housing. Hopefully we hear something today! We could not have done this without the help of friends/family staying at our home, watching our animals etc. 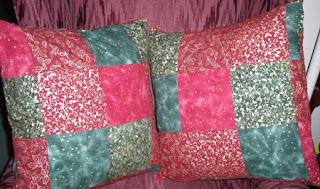 Thanks to Maggie's post over at Patchmaker's Quilts, I now have an endless supply of crochet patterns to choose from. I've bookmarked a lot of blogs to keep up with while we are away. Keep up the great crafts! !